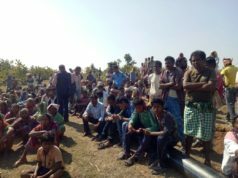 Report by Odisha Diary bureau, Boudh: Children without parental care or children separated from their parents usually live in difficult circumstances. These vulnerable Children are the most exposed to poverty, exclusion and discrimination which in turn can cause them to become even more vulnerable to abuse, neglect and exploitation. We are concerned that each child is different and we need to see each as an individual case with distinct life history and a unique set of current circumstances. The fact is that a child has not reached a particular developmental stage that is average for his or her age may be, but is not necessarily an indicator of neglect, trauma or abuse ,rather there can be different routes to encourage it and support the development of their potential through a proper plan or individual care plan. Under the ICPS it has been mentioned that govt / State govt have responsibility to establish a system of continuum of services to the children for outreach, institutional care, family and community based care, counseling and support service so that the child will enjoy the childhood life in a protective environment. Institutional care is the last resort after all other option has been explored. To add on this Child protection’ has become one of the most important components of child welfare today to protection of the children from risk and harmful situations by reducing their vulnerability. The Constitution of India too provides the special attention under the constitution of existing laws and policies to safeguard children and to ensure child protection under ICPS (Integrated Child Protection Scheme – A Centrally Sponsored Scheme of Civil Society Partnership).As we know that the Integrated Child Protection Scheme (ICPS) is a governmental program implemented by the Government of India to help and secure the safety of children with a special emphasis on children in need of care and protection, and juveniles in conflict or contact with laws .This was introduced to bring all the child protection policies under one umbrella and to create a central structure to provide oversight and standardization for pre-existing and evolving child protection schemes in India. Proposed in 2006 and implemented in 2009, the ICPS is administered at the state level by state child protection societies and at the district level by district child protection unity. However inspite of implementation of ICPS many gaps in the child protection mechanisms exist due to lack of awareness and coordination. Keeping this in backdrop YCDA has organized a district level seminar on child protection and ICPS where community based organizations, civil society groups and voluntary organizations will play an active role in assessing the translation of good policies into action, engaging the public counterparts in their continuous review, highlighting the evidences on limitations or violations, and eventually suggesting possible improvements. • To sensitize the civil society and stakeholders on the situation of orphan and vulnerable children without parental care and various alternative care models and its inclusion in policy framework of the state. • Popularize the concept of alternative forms of child care and take an active part in implementing the existing laws related to child protection and alternative care under Juvenile Justice Care and Protection Act 2002/6 and ICPS in the state/district. • To ensure that orphan and vulnerable children in the district have access to opportunities and services that promote their rights to survival, development, protection and participation in a family and community based care set up. In welcome session Mr. Madhusudan Mishra, IAS, Collector, Boudh gave his concern every child should enroll in school, zero dropout in Boudh district, No child child labour free district and no child marriage, children should save some amount in piggy bank . Mr. Rajendra Meher, CEO, YCDA spoke in his speech on focus on convergence and coordination among the line department and civil society to address the child rights and child protection issues. 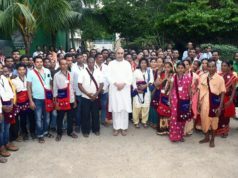 Mr. Srikant Tarai, Sub Collector, Boudh emphasized on the role of administration to create a safetynate for the children where he or she can enjoy the child rights and ultimately the family gets empowerment and developed socio economically. That too he stressed on social security schemes available with Govt. for both child and family to address the educational issues. He shared some case stories who have got success with the support of Piggy Bank and teachers whose concern was to child development and child protection. Mr. Abhaya Mallick, DEO,Boudh emphasized on issues of child labour and process of right to education. His concern was to implement on right to education in whole heartedly, so that no child will be out of school rather till 14years the child would get quality education. 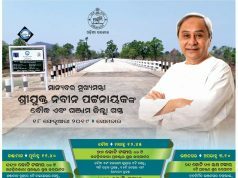 He has also shared on the pre education which is coming under the ICDS and expected if the child gets good education on pre primary education then the potentiality of the child would comeout with the child. 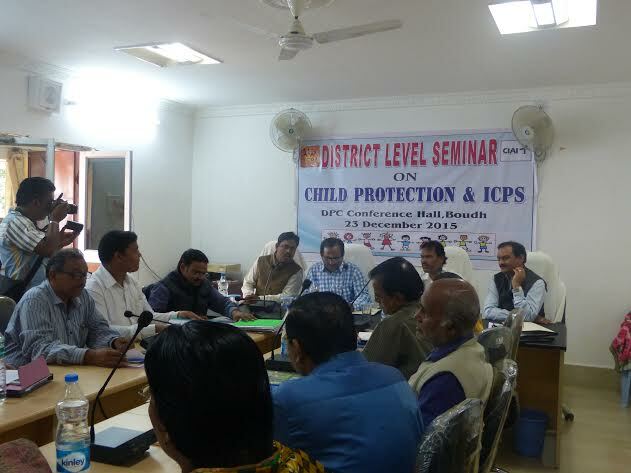 Mr. Rahul Pradhan, DCPO Boudh gave the brief introduction on ICPS and various structures and mechanism working on the child protection across the district and state. Mr. Arun Pradhan, Project Director, YCDA and Member CWC Khordha emphasized on the non institutional care and system for the CNCP children working in state and district. The objective of the workshop was given by Ms. Preeti Bhagia, Programme Manager, YCDA and field experience working under the Integrated Child Protection Project was shared by Rupam Mahapatra, YCDA. At last Mr. Alok Padhi, YCDA gave the vote of thanks to all participants for their concern to address on child protection.